Russia is the largest country on earth by surface area, covering more than one-eighth of the world’s inhabited landmass. Spanning all the way from Eastern Europe to North Asia, it boasts an enviable variety of landscapes and dynamic cities. Given its size, Russia offers plenty for the avid adventurer. As well as the mighty cities of Moscow and St. Petersburg, its 17 million square kilometres covers expansive countryside, thousands of rivers and lakes, majestic mountain ranges and unsung historical towns like Veliky Novgorod, Pskov and Suzdal. Fairy tale castles dominate the skylines of Alupka, Crimea and Yoshkarola, while the Altai region in Siberia affords wonderful hiking trails; Russia has an endless choice of outdoor pursuits. Of all Russian allures, the capital city is the most persuasive; Moscow embodies the nation’s politics, history and arts, as well showcasing the finest man-made structures. Standing on the Moskva River, the city’s focal point is the Kremlin, a complex of fortress walls, home to the president and tsarist treasures, with the famous Red Square lying just outside. Stories of the Soviet Union are told in poignant monuments and fascinating museums, while a wonderful selection of performing arts, such as ballet and classical music recitals, represents an insight into quintessential Russia. The second largest city, St Petersburg was the imperial capital for two hundred years when it was founded in the 18th Century. It remains the country’s cultural centre, home to iconic venues such as the Mariinsky Theatre and the State Russian Museum, featuring everything from Orthodox paintworks to abstract pieces. Known as the Venice of the North, St Petersburg is criss-crossed with some 340 bridges across the Neva River. Spilling over two continents, ferries to Russia come from both Europe and Asia. 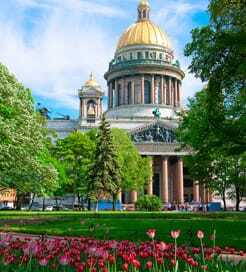 With the western coast merely an inlet of the Baltic Sea, the European routes depart from a handful of Nordic and Baltic nations, arriving in St Petersburg. On the east coast, the large port city of Vladivostok sees weekly ferries from South Korea. Sailings to Russia are generally long-haul, so it’s a good idea to book some comfortable accommodation for the trip. For more information, please visit our Ferries from South Korea to Russia page. For more information, please visit our Ferries from Finland to Russia page. For more information, please visit our Ferries from Japan to Russia page. For more information, please visit our Ferries from Sweden to Russia page.